It’s quite surprising the amount of different ways you can put an opening in a wall, and they all have slightly different properties in regard to how they behave and how surrounding elements behave. This is my finding with Revit ARCH 2010 original release. Most opening now seems to behave well, but great care need to be taken on openings where copy / monitoring is planned. Let’s look at all the opening tools and see how they behave differently. 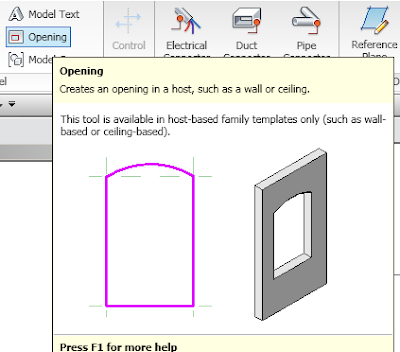 Wall Opening Tool within a project file. Can only be rectangular in shape. Can put an opening in a Curtain Wall. Can only cut one wall at a time. Height is level based. – Move the level the opening will move. Stretching the wall boundary inside the opening is acceptable. Can only be a perpendicular opening to the wall. Copy / Monitors correctly but needs to be created in file the wall was originally created. Can put an opening in Curtain Walls. Height is wall base offset based. – Move the wall base and the opening will move. Stretching the wall boundary inside the opening will cause the wall to be invalided and it will be deleted. Opening using an In-place family opening tool. Copy / Monitors but needs to be created in file the wall was originally created in. In the copy file it simplifies the shape into a rectangle. 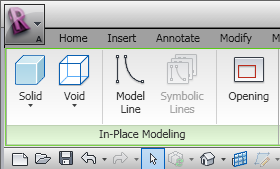 Opening using an In-place family void and cut geometry tool. Can be any shape or direction. Does not need to cut the entire wall. Copy / Monitors but needs to be created in file the wall was originally created in. In the copy file it simplifies the shape into a rectangle and only cuts the first wall. Shapes that should be partly be cutting the wall will fully cut it. Opening using an external rfa family file which is wall hosting using the family opening tool. Copy / Monitors correctly but needs to be created in file the wall was originally created in. In the copy file it simplifies the shape into a rectangle. 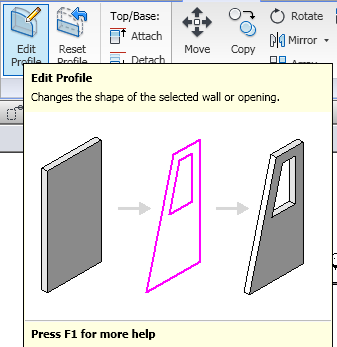 Opening using an external rfa family file which is wall hosting using the void and cut geometry tool. Can be any shape or direction. Does not need to cut entire wall. Copy / Monitors but needs to be created in file the wall was originally created in. In the copy it file simplifies the shape into a rectangle. Shapes that should be partly cutting the wall will be fully cut it. I am graduate student studying the BIM. This article is really helpful.